No really, do not click here. 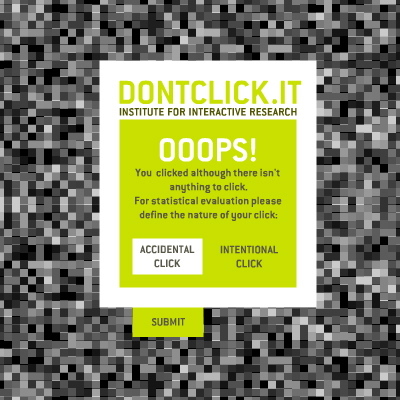 The Institute for Interactive Research’s DontClick.it website is a reference I use in my beginning interactive media design classes – to me, it is a web classic. This site was made in 2005 and since then I haven’t seen much online experimentation with how users operate their mice. I can’t help but wonder: Are we controlling the mouse, or does it control us? A few nights ago I showed this in class and as usual, one student shouted out “Hate It!” in less than twenty seconds. Others were amused for minutes. In this age, minutes are precious, so the DontClick.it site seems to have remained timely after four years. For more inspiration about clicking and thinking about clicking…or not thinking, a classic text that corresponds to this reference is Steve Krug’s Don’t Make Me Think: A Common Sense Approach to Web Usability, 2nd Edition .